To be fair, ANYBODY who does that stupid fad is a dangerous life form. Except for that monkey. "But who owns the copyright to the photo?" - well, according to modern EULA/ToS "agreements", copyrights seem to be implicitly transferred to (and thenceforth, for all intents and purposes, owned by) whomever owns the "cloud" the data in question was first uploaded to (whether knowingly to the end user or not). Which fact the episode title might or might not have been a jab at. The term "moon" only has a well-defined meaning if it is known (implied by the context, or otherwise) what planetary system the body in question is part of, which seems not to be the case here. What does Xöb mean by saying "moon"? A natural satellite orbiting what body in what system precisely? > A natural satellite orbiting what body in what system precisely? So, are they going to find that monkey, and have it drag one of them in the water, where it gets shot, and they get in deep trouble on Zob's Homeworld? 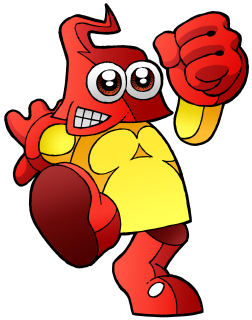 Unrelated, but what if Plok was ported to GBA? Then the soundtrack would be severely messed up. And, just like every non-First Party SNES game remade to the GBA, the port would be swiftly forgotten. Just look at Aero the Acro-Bat, Lost Vikings, Mr. Nutz, Prehistorik Man, and other ports or remakes. NOBODY remembers that they had GBA conversions, and all sold poorly. I'm against SFC/SNES-to-GBA conversions purely as an audiophile. I don't want the music that sounds so great on the Nintendo 16-bit console sound like crap on the handheld due to said handheld's tinny sound samples. There's also the fact that despite being purportedly more powerful than the SFC/SNES that the screen would be uncomfortably cropped, the color palettes would be brighter, and there would be moments of slowdown present which wasn't the case in the original Nintendo 16-bit format; but more pressingly the music will become inferior. That's what would happen if Plok was subject to that embarrassment. In hindsight, the developers' intentions when it came to these moments were noble; but the truth of the matter is that SFC/SNES to GBA transitions was purely ill-advised, and should never have happened. I think the main problem would have been a lack of buttons, Plok used all 4 buttons and the L and R buttons. Now DS would have been fine...Though I'd just be happy to see plok get some kind of release anywhere. The "New" 3DS SNES virtual Console would be great, Plok where ever I am...one can dream. >Unrelated, but what if Plok was ported to GBA? What's the point in porting a piece of software to a hardware platform which itself has been obsolete since at least a decade or so? So we can laugh at how incompitent it could potentially be. Just look at Sonic 1 on the GBA. Or it could be a port that closely resembles the original, and expand on it (like the Super Mario Advance series), and nobody would care, instead favoring the originals (except for Yoshi's Island, which has the GBA release on Virtual Console on both Ambassador 3DS and Wii U). Even IF the number of buttons were the same or not it would still result in an inferior-sounding port and it would still not be excusable. Equinox (my favorite Software Creations game) would not be the same near-excellent experience on the GBA as it is in its native Nintendo 16-bit format, Plok would not feel the same, really ANYTHING would not feel the same on the GBA if it was being ported from the SFC/SNES especially when the handheld's shortcomings are so keenly felt if you've had experience on the Nintendo 16-bit console beforehand; the only people who wouldn't recognize the low points would be those who've never had the privilege to play on the SFC/SNES console (they're missing out big time). It's one thing if it's a GBA-exclusive title; but if it's a GBA PORT of an SFC/SNES it's another one completely--and I'd rather play when it comes to the GBA the former than the latter because at least with the former it's easy to view it as its own thing as opposed to the latter which is only going to be hampered as it will be heavily compared to the Nintendo 16-bit edition. While I agree with the above statement, A SNES can't be carried in your pocket, be played during long car journey's where you pester your mum to ask where's the next place with a toilet, or be used to ignore the old person sat next to you on the bus. Also I really don't remember that many SNES-GBA ports...NES yes but not SNES, maybe I was living under that rock again...or I didn't care as the GBA SP wasn't out so I knew I wouldn't be able to play them as I couldn't see the screen. Super Mario World (Super Mario Advance 2), Yoshi's Island (Super Mario Advance 3), The Legend of Zelda: A Link to the Past, Super Ghouls'n Ghosts, Rockman and Forte, Final Fantasy IV, Final Fantasy V, Final Fantasy VI, Breath of Fire, Breath of Fire II, Mr. Nutz, Aero the Acro-Bat, The Smurfs, Pitfall: The Mayan Adventure, The Lost Vikings, The Magical Quest starring Mickey Mouse, The Great Circus Mystery starring Mickey & Minnie, Mickey & Donald: Magical Adventure 3, Tales of Phantasia (!!!!! ); the list goes on, you'd be surprised. And while it's true you can't play an SFC/SNES console on the go, there is a SupaBoy system which is essentially a handheld equivalent of the Nintendo 16-bit console... though technically it [the SupaBoy] isn't an official Nintendo-made system. Since it looks like Mother 3 isn't getting localized through the Virtual Console, the only way we're getting it legally is if they remake it, meaning they will have to update both the graphics and the music. Since the original game was on the GBA only, the music will likely improve on whatever new system Nintendo has by the time they finally decide to remake this game, though I'm sure a few songs will actually sound worse on the new system, kind of like how Final Fantasy X Remaster changed the music and didn't give up an option to use the original sound in earlier releases. Also, even with a remake, Mother 3 wouldn't be guaranteed a localization. Since one of the commenters pondered what would happen if an SFC/SNES classic like Plok got ported to an inferior handheld system like the GBA. Screw porting Plok to the GameBoy Advance. Port it to the Atari 2600! Wow. There's no predicting the discussion on here. Pancakes are inferior to waffles. Whoever denies this is delusional. Toggle between L and R - Activate chain saw. See this wouldn't even be impossible. You guys are making the mistake in believing that L and R were fully used buttons when in fact they only worked in tandem with each other. However this is arguably a worse control scheme, no doubt about it. About the graphics and sound: Look at the ports of the Donkey Kong Country games for evidence why I think SNES to GBC ports are awful. Little do you know Xöb LOVES playing with the Game Boy Advance. That's why we're still talking about a Plok port to the GBA, right?